Why the corporate media keep lending the far-right legitimacy. 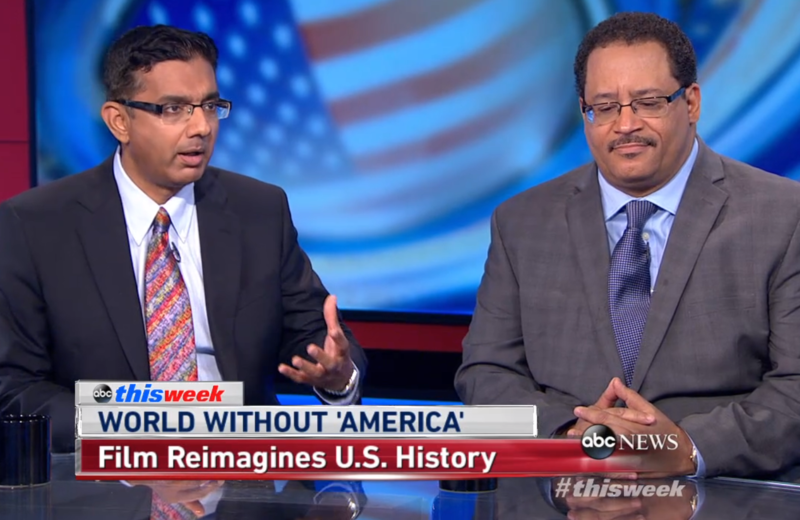 The debate was between D’Souza and MSNBC contributor Michael Eric Dyson, but giving a prestige platform for D’Souza’s latest wack-job theory (this time it’s a nefarious connection between Hillary Clinton and Barack Obama) is akin to giving climate deniers equal media time with climate scientists. D’Souza denied it was a conspiracy theory, but then went on about how Clinton and Obama were both influenced by radical community organizer and writer Saul Alinsky. Hillary met him in high school and wrote a college thesis on him; as a young community organizer in Chicago, Obama was influenced by some of Alinsky’s teachings. And therefore… what? Hillary and Barack telepathically exchanged Alinsky vibes so they could turn the country red decades later? As Crooks and Liars points out, D’Souza didn’t mention that the right is now embracing Alinsky’s tactics or that in high school Hillary was also a Young Republican and a “Goldwater girl.” Nor are secret socialist sympathies evident in these two centrist Democrats. Hillary, knocked by left and right for only ambiguously owning up to her substantial wealth, is more of a Wall Street symp. A front-page New York Times story today starts: “As its relationship with Democrats hits a historic low, Wall Street sees a solution on the horizon: Hillary Rodham Clinton.” As for Obama, if only he followed Alinsky’s emphasis on confrontation a little more. It’s not that Tea Party types shouldn’t appear on the networks’ signature Sunday shows; they should, they’re in the news. It’s just that when they do, they’re not grilled terribly hard. It’s as if mainstream media are as afraid of the far right as John Boehner is. I wrote above that ABC helped legitimize D’Souza. Let me amend that: “gets” like D’Souza or Ingraham help legitimize ABC News with the Tea Party right. Sometimes seeking balance is really a plea to call off the dogs.